"Whether through the solo playing on some tracks or the impressive ensemble work on others, the results are uniformly assured technically and attractive musically." "This can take its place nicely as a calling card for the Guildhall, showcase for Bissill, locus for some eminent colleagues to display their wares, and encouragement for experimentation in the repertoire." 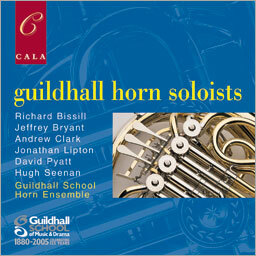 The distinguished teaching staff of the horn department at London's Guildhall School of Music and Drama are joined by their talented students in an exploration of familiar and new horn repertoire for soloists and ensembles.